run for women – Pump Those Crazy Legs! Today I participated in the Shoppers Drug Mart Run for Women. 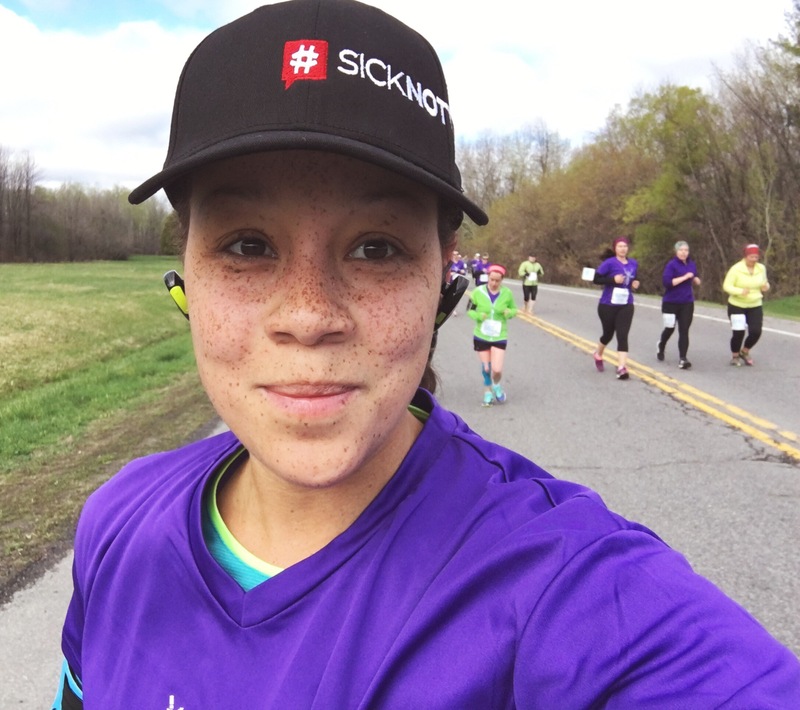 It is a race in support of the emotional well-being of women, with funds raised going towards the Royal Ottawa Mental Health Centre. This is a cause very near and dear to my heart, having spent my life working to keep my own anxiety and depression in check. Various forms of mental illness affect many of the people close to me as well. For this reason I have also recently joined a couple of initiatives that provide an online community of emotional support, too: #SickNotWeak and #ImNotAshamed. 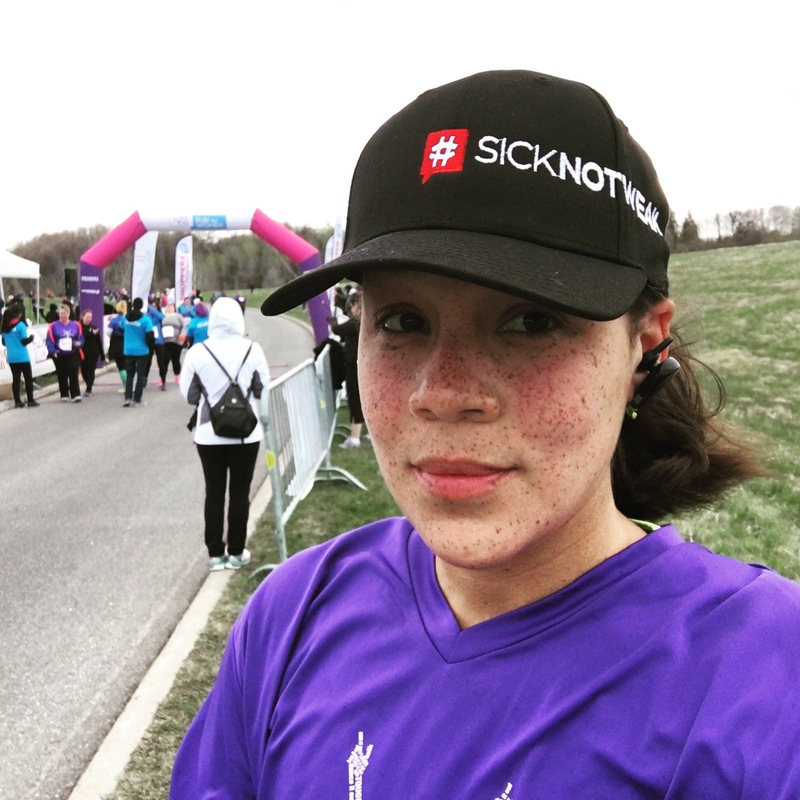 My SickNotWeak hat actually arrived in the mail during the week, so I was able to incorporate it into my running outfit for race day! Plus, I am notorious for having nervous-pee-syndrome, despite having not consumed any water beforehand, and arrived with about three minutes to spare before the race began. The lineup for the bathroom was so long it faded into the horizon; I was clearly doomed, which is when somebody told me I should just ask to jump in front as the 5k race for the people in line wouldn’t start until later anyway. While I was meekly asking if anyone would be cool with me butting ahead of them, somebody said, “Look, a free bathroom, GO! 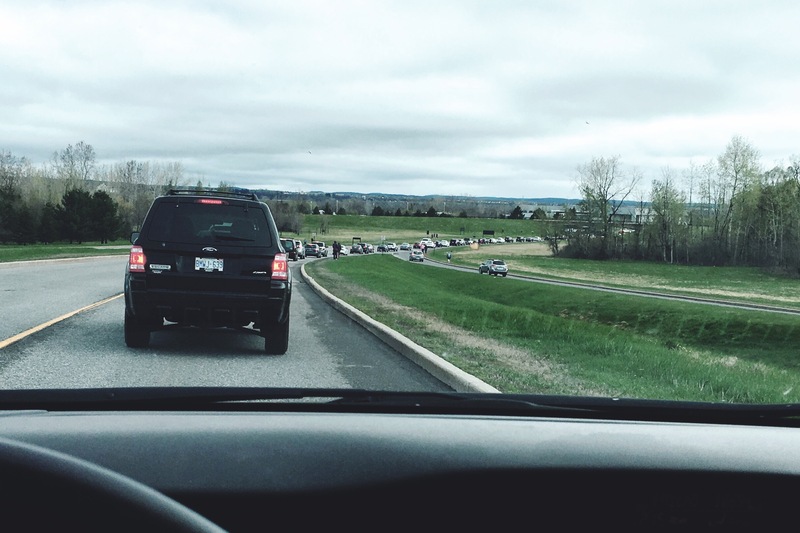 !” and I totally bolted into the unnoticed available porta-potty without a moments hesitation. Thankfully, I’m the type of person who can pee in the amount of time it took me to sit and lock the door, so I was in and out in a matter of seconds and arrived at the starting line just in time! FML and phew. The race itself went very smoothly. We all naturally spread out into clusters of varying paces. I noticed a few others doing 10:1s as I was doing myself. (I find the walking breaks allow me just enough time to recover, and actually helped me maintain my speed while running such a long distance.) The overtaking runners stuck more to the left-hand side, and when walking we’d raise our arm and head over to the right (I actually went all the way onto the grass for my walk breaks). It was all impressively seamless. Despite the fact that it was a sunny and beautiful 25°C day on Saturday, today was a completely different story. It had rained all night and had only just stopped when I began getting ready to head out. It was windy and cloudy and the temperature read -3°C with the windchill. Of course, I muttered to myself, of course it is. Somebody mentioned at one point how a brief drizzling of rain had actually transformed into a light snowfall, and we all died a little inside. Winter has serious attachment issues with my city. It’s time to let go. Nonetheless, despite the chilly air blasting at me, I chose to wear a simple long sleeved shirt under the “love you” technical tee I had picked up with my race kit. But I saw many people had dropped off their jackets at a point at around the 2.5k mark of the race. We were doing an out-and-back so they could just pick it up on their way back again. And by that point we were all feeling a little roasty! I crossed the finish line and was thrilled to see that I had just barely managed to hold on to an average pace that was within the 6 minute per kilometre range, throughout! (Specifically 6:56min/km.) Back when I was running 5k races last year I never got that fast, so my mind was absolutely blown away. Of course I still wanted to be much faster, but my knees and shins were telling me that this was good for where I’m at with my training now. 😉 I’m just so pumped to get faster, which I think will only happen as I continue to work on running longer distances on LSD Sunday’s. The Army Run had me spoiled for photography, so I was a little disappointed that there wasn’t anyone to capture my big moment even just crossing the finish line of my first 10k race. Most runners came in groups and took photos together with the backdrop which was set up for our run as well, and I felt a little disheartened being the only person all on her own. I did manage to get a couple of selfies in, however. Including one I took during the race, while running, haha! Before heading home we all waited in line to pick up our swag bag courtesy of Shoppers Drug Mart. 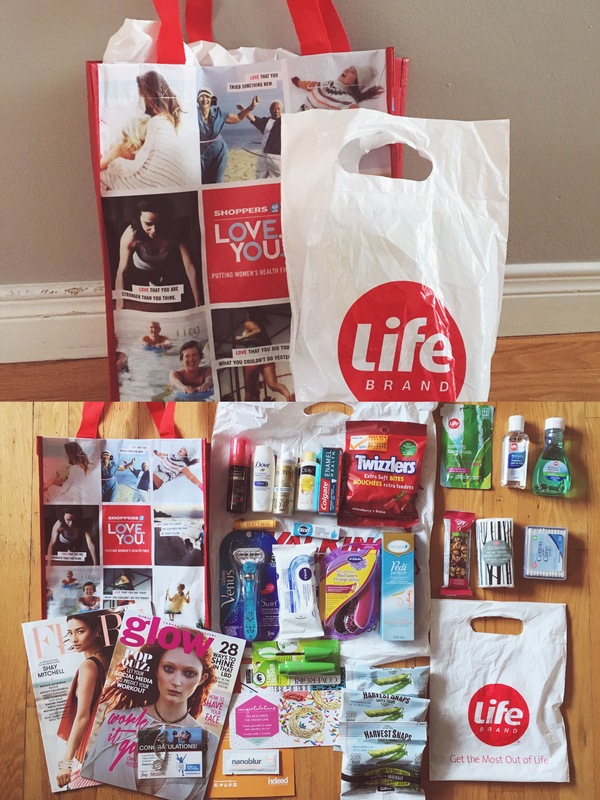 It contained $50 or so worth of goodies, and there was another stand offering a little bag of free Life Brand products as well. I have never gotten so many treats from a race before! And the medal we received was actually a silver bracelet with a charm on it that reads “love you”! Only 19 more days to go until Tamarack Ottawa Race Weekend! !